THANDWE, Rakhine State – Rakhine State is one of Myanmar’s poorest regions, where fishing is an important livelihood and business, while it also provides food for many subsistence fishermen. A 2014 Oxfam report estimated 43 percent of the population was to some degree dependent on fishing or aquaculture. The industry has been in a long decline, however, as fish catch has been falling for years, with some research estimates a 65 percent decline in the last 30 years. Reasons for this fall range from illegal fishing and overfishing, to environmental degradation along the coast. Cold storage facilities for the fishing industry are limited and have closed down in recent years, while transport options to send produce to towns and cities are undeveloped. 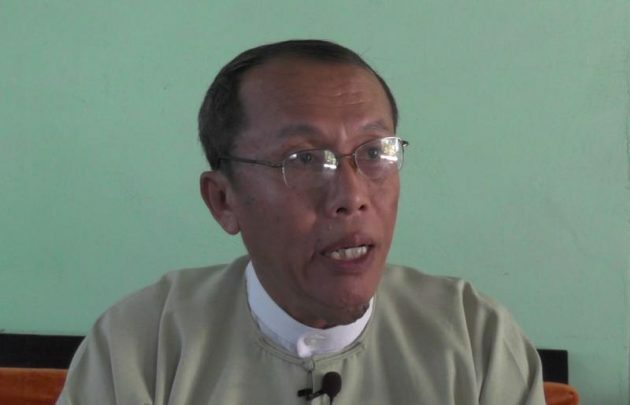 Myint Thein, a Fisheries Department officer in southern Rakhine’s Thandwe District, an area with thousands of fishermen, discussed these challenges with Myanmar Now in a recent interview at his office. Question: How does your department promote sustainable fishing? Answer: We have held public talks in villages in this area to address the decline of fish breeding, which occurs amid climatic change and deforestation (of mangroves). Local fishermen said the size of fishes has become smaller. Among the causes are (illegal) fishing methods that use poison, electric shock and blasts – these destroy fish eggs and catch fingerlings. Penalties have been tightened for such prohibited methods. There are some ongoing court cases for fishing with poison in Taunggup Township. These laws can prevent unsustainable fishing. Both fishing firms and fishermen need to follow these instructions to develop our fishery industry. Q: What legal action can be taken against illegal fishing? A: Illegal fishing is prohibited by Article 51 (in the 2014 Rakhine Freshwater Fisheries Law), which states that an unregistered fisherman may be fined up to 100,000 kyats (around $70) or a prison term of one month, or both. If fishing businesses operate without license the owner would be fined up to 500,000 kyats, or a prison term of six months, or both. Mandatory registration will help our department to collect state revenue and to keep track of the exact number of fishing boats. Q: What measures can be taken to reduce poverty in Rakhine State fishing communities? A: Our Fisheries Department has been allocated 30 million kyats ($70,000) to provide small loans to fishing villages under the Emerald Project, which is implemented under a poverty alleviation plan. This programme covers three villages, Jajetaw, Kha Maung Tone and Sin Gaung in Thandwe District… This loan programme is implemented locally by a village-level committee, with low-interest rates fixed by the committee. Local fishermen form a committee under this project and this committee decides on a reasonable interest rate, ranging from 0.5 to 1.5 percent. Funds received from the interest are spent for local development programmes. Our Fisheries Department, along with international and local NGOs, is also doing a survey on how to improve socio-economic conditions of local fishermen. We are collecting data on the type of fishing boats, catch and the best fishing areas. After the results on the survey are in we can determine the exact habitats of fingerlings and the fish species caught by fishermen. Then we can discuss how to cooperate between fishery department and other stakeholders in order to uphold sustainable fishing practices. Q: What is your suggestion to NGOs who want to reduce poverty here? A: The NGOs have collected data to support sustainable fishing and develop the fisheries sector in this area. I suggested to them that the local fishing industry needs more capital, technology and market access. A close link is important among these three aspects. Raw fish should be produced into finished products by using more capital and technology, while we also need better market access for the finished products. Q: What are some of the obstacles for developing the fisheries sector? A: When we held a survey for this business, we found that local fishermen assumed they already have sufficient technical know-how. They just wanted capital. But they should understand technology is more important than capital. They need to understand how to develop raw materials into finished products to generate more income. We are disseminating this idea. But we cannot do it throughout the whole region because we are very understaffed. Q: What is the status of the shrimp farms in this area? A: The salt-water shrimp industry in Thandwe District has declined in recent years after it lost its market, although it was thriving 10 years ago. We are now conducting shrimp-breeding training courses. Q: Abandoned shrimp ponds cannot be reused for farming, is that a problem? A: We are developing shrimp ponds at places where agriculture cannot be carried out. So this shrimp-breeding industry will not cause any problem for the agricultural sector. Q: How do you plan to get fresh produce to the urban markets, in Yangon for example? A: Our fishery department mostly conducts short-term shrimp breeding training. We welcome any suggestions for this sector, but we cannot create its market, we can only hold discussions to get new ideas. *This article first appeared on Myanmar Now on 13/1/2016.